When you apply a 2D transform to an element, you use the RenderTransform or LayoutTransform properties to specify the transform to apply. You set the value of these properties to a single instance of the Transform type. Often, the value of the Transform type will be a specific transform, like ScaleTransform. However, you can combine multiple transforms by setting the property to an instance of a TransformGroup, which in turn contains a collection of Transform elements. 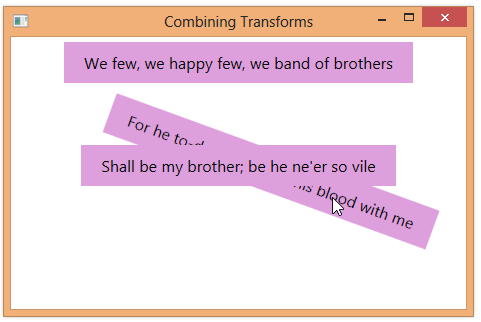 In the example below, we first apply a rotate transform to the middle label, followed by a translation transform. <Label Content="We few, we happy few, we band of brothers"
<Label Content="For he to-day that sheds his blood with me"
<Label Content="Shall be my brother; be he ne'er so vile"